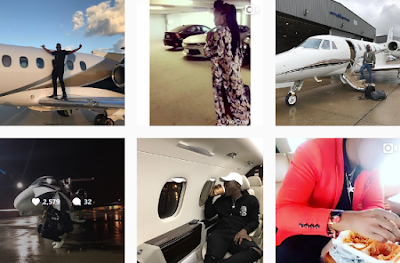 If you go through the embattled singer's IG page, the last 12 photos he posted shows him living the life...that he apparently can't afford. There are so many private jet photos and before he was arrested for identity and credit card fraud, (which he allegedly used to pay for the private jets) you can see some of his followers hailing him and envying the fake luxury lifestyle he was projecting, with no one asking how he can afford it. Do you guys know how much it is to hire a private jet? But the important question is; why is there so much pressure on young people, a lot of them entertainers, to project a lifestyle that is not their real situation? Where is the pressure coming from? When you live your life for instagram likes, followers and comments, then you're empty. And many feel the best way to get those followers and likes is to show a fake life, get people fascinated...just so they can say 'My life is badder than yours' when in real life, it's actually the same, or more pathetic.